What is Personal Financial Engineering? the process of Personal Financial Engineering for all our clients who truly want to strive for financial independence. Personal Financial Engineering is a system of financial decisions that seeks to help increase wealth creation potential through the “velocity of money multiplier” concept. This system teaches you how to have one-dollar work like two, three, or more dollars. Additionally, it focuses on preserving your wealth from eroding forces. A key principle of Personal Financial Engineering is that it is not limited to simply meeting an individual’s needs and goals. It is a cash flow system that uses the velocity of money as the main force, rather than the accumulation theory. It’s the idea of keeping your money in play. The dollar is kept it in motion, using it over and over again. 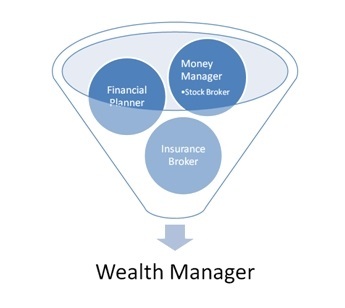 Why use Personal Financial Engineering? We live in a world of complexity and rapid change. Keeping up is difficult. Knowing which money decisions to make is not easy. Information overload can lead to financial paralysis. You might lack the time to properly research all aspects of your money decisions. Government is constantly changing the tax laws. Changing tax laws make it difficult for the consumer to plan easily and successfully. The tax laws have become more complicated. This can cost you both time and expense in completing all the required tax forms. It is important to note that investing involves a varying degree of risk including the potential loss of principal and no investment strategy can guarantee a profit in declining markets. The stock market fluctuates up and down. It can move in cycles. A problem can exist when you need your money in a down cycle, or worse yet, when you own stocks that have declined in value. If we could time the market that would be great, but it cannot be controlled. Misinformation contained within the Media or Financial Institutions. Potentially misleading information regarding financial products and strategies is prevalent on the Internet and in financial magazines, and financial “How To” books. This can leave the consumer with a less chance to create wealth and preserve it. We will review the merits of all these strategies for your particular situation. At Gotham Financial, clients often engage us to be their personal financial quarterback, streamlining the financial planning process and eliminating the need for multiple advisors. The resulting relationships are analogous to a professional sports team, with an owner, a coach and players. We also find this helpful in illustrating our clients’ fees for the Gotham GPS™. You (the client) are the owner, employing a coach and players for your team. Gotham acts as the coach. We help determine the financial game plan (strategy) that stives to make the team successful. We then help determine what players will be needed to carry out the strategy. The players are your attorneys, CPA, money managers, insurance carriers and other advisors who will impact your financial affairs. They carry out the coach’s directions. 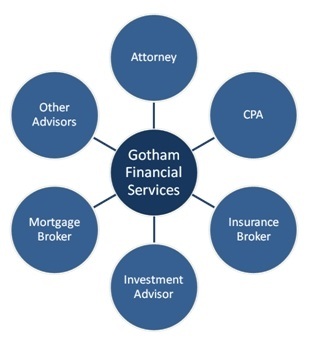 Why would affluent clients choose Gotham Financial as their "coach"? First and foremost, we have experience in asset allocation and financial management services*, with a focus on advice rather than being product focused. Like a good coach, we look at the whole field, determine with you the best strategies to help reach your goals, and find the best players to make it happen. Many levels of "coaches" work in financial services. What we believe sets Gotham apart is the comprehensive nature of what we can accomplish as your personal GPS. Let’s look at the different types of financial advisors. The emphasis here is on advice rather than implementation. With our GPS system we offer an experienced level planning that includes complex issues such as stock option planning, charitable giving, trust and estate planning, executive planning, etc.